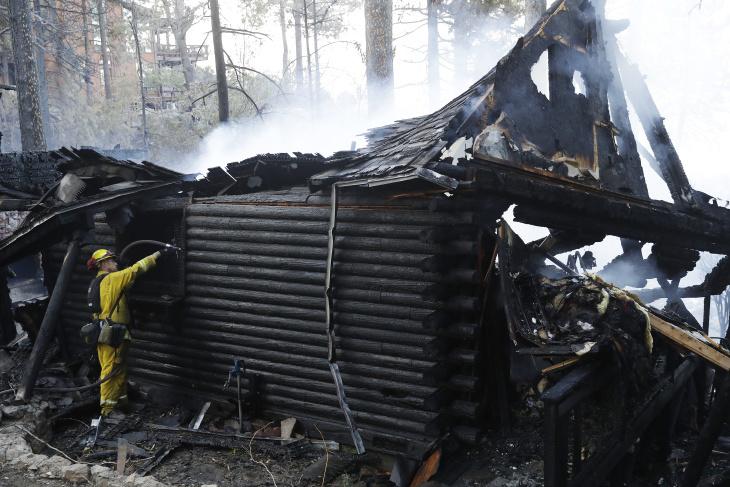 The mountain community of Idyllwild had been spared a devastating fire for more than a century. Now residents of this small town high in the San Jacinto Mountains await word of whether they've escaped again, or face devastating losses. On Thursday, Gov. Jerry Brown declared a state of emergency for the Cranston Fire that began near Idyllwild shortly before noon the day before. NOTE: Overnight Thursday, the fire grew to 11,500 acres and is now only 3% contained. Carla Javier is reporting from the scene and will have more Friday on how the Idyllwild Arts Academy students and teachers are coping as they await word. Follow her on Twitter @carlamjavier. "This our home, for almost 50 years," said Yung Neu. "So now we don't know if we have a home. We have to wait." The fire grew alarmingly quickly — from the first report of 25 acres burning to more than 4,000 acres by nightfall. 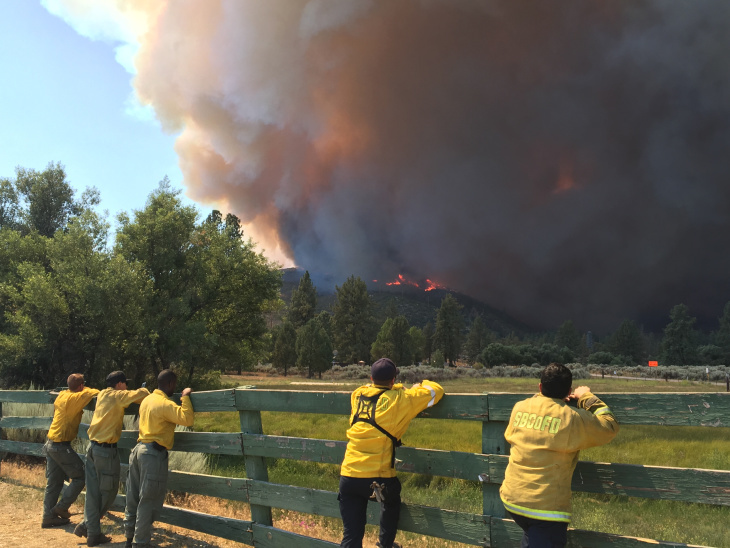 At 8:30 p.m. Thursday, San Bernandino National Forest officials said the fire had grown to 7,500 acres and was only 5% contained. Fire officials said 6,000 people had evacuated the area and nearly 5,000 structures were threatened. Intense heat from the fire produced rare pyrocumulus clouds, visible for many miles, that generated high winds and were capable of sucking up embers and raining them back to the ground. 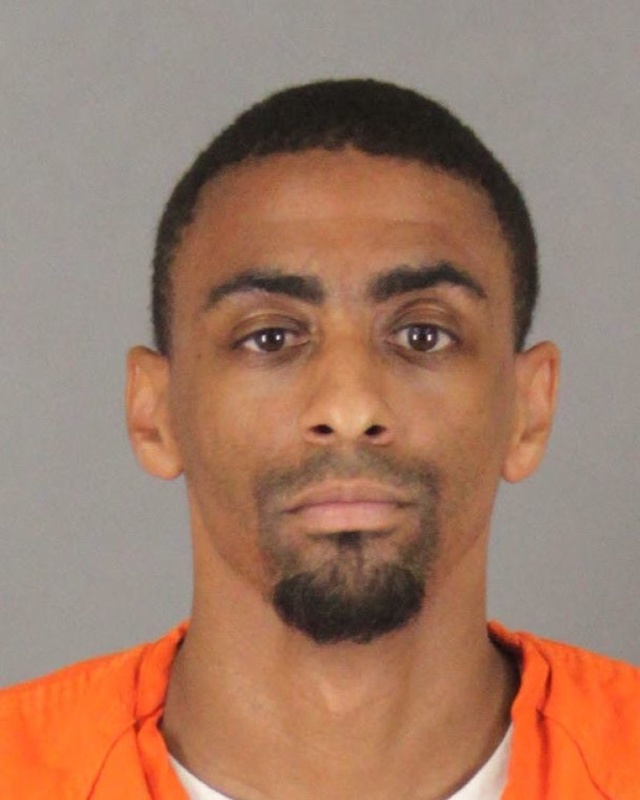 Authorities have arrested Brandon N. McGlover, 32, of Temecula on five counts of arson. He was arrested Wednesday after authorities traced several fires in Southwest Riverside County, one of which grew into the Cranston Fire. More than 1,000 personnel are working to fight the fire, with no estimate of when the it will be contained. Idyllwild is among nine communities under mandatory evacuation orders, in addtion to the Camp Scherman Girlscout Camp. A significant number of recreation areas in both Mt. San Jacinto State Park and the San Bernardino National Forest also are off limits. Riverside County officials said late Thursday they anticipated having to open additional shelters, in part because it might be hard for people on the far side of the fire to get to Banning High. Forty-three people spend the night there Thursday. Living at 5,400-feet high up in the San Bernardino National Forest, Idyllwild residents face fire risk year after year. In 2006, five Riverside County Fire Department firefighters, including some assigned to an Idyllwild fire station, were killed in the Esperanza fire that wiped out 34 homes and came close to Idyllwild. The Mountain Fire in July 2013 came even closer to the community. Idyllwild has more than 11,000 residents and many vacation homes. When the town is not evacuated, weekend visitors stroll a couple of blocks of shops, cafes, with a hippie vibe and a new brew pub doing vigorous business. Darla Priest was high in the fire tower on Tahquitz Peak when the fire broke out. The volunteer fire lookout first heard word of the fire over the forest service radio. Then the column of smoke started rising, like a plume of ash from a volcano. As Priest started taking video, the tower leader called. She needed to get out. So Priest started down the mountain with her pit bull, Metallica. She faced a 4 ½ mile hike through increasingly dense smoke. "You get that shaky feeling when I was coming down, trying not to go too fast where I would trip and hurt myself or something," she said. "But at the same time — move, you know." She considers the mountains her home. "I really don't want to go live in city right now," Priest said. "I'm hoping the community is saved." Many in the area say it's hard to get their head around the fact that authorities believe the fire was set on purpose. Arson investigators said it was a trail of fires that led to the arrest of McGlover. As a series fires broke out, officials suspected they had a firesetter on their hands. "Once these fires started, it set up a trail that started from Lake Elsinore and eventually moved up towards highway 74 and the Idyllwild area," said Riverside County Fire Department Captain Fernando Herrera. Some of the fires were in the Anza and Aguanga area. Cal Fire arson investigators put together a description of a suspect in the fires and notified other law enforcement agencies who swarmed along what might be his route. The Hemet/San Jacinto Valley Gang Task Force located McGlover and held him, and Cal Fire officers made the arrest. He was booked into Cois Byrd Detention Center in Murrieta on the five counts of wildland arson. More counts could be added, Herrera said. McGlover is scheduled to be arraigned on Friday. Even without human intervention, the stage has been set for an Idyllwild fire for awhile. Fire ecologist Richard Minnich says the last time a fire burned through the small town was before recorded fire history started in the late nineteenth century. So there might be an ignition that starts the fire—a lightning strike, a lit match, a fallen tree on a hot day—but those ignitions only catch when vegetation gets old enough to burn. "The cause of the fire is the vegetation, it's not the ignitions. Ignitions are ubiquitous," he said. "An ignition is an instantaneous event. Split second. But the vegetation is building energy over scales of decades, and that's what counts." Fire management focuses on stopping ignitions. And Minnich says they're successful almost every time. That lets vegetation build up until an ignition sparks a fire that firefighters can't immediately suppress. One like Wednesday's, when there's triple digit heat and dry wind. "It's like worrying about which snowflake starts an avalanche. Who in the hell cares which snowflake puts enough weight on that slope with snow that it'll finally slide down. Nobody cares. But we're doing that, we're chasing snowflakes," Minnich said. When fires are not suppressed, Minnich says they burn about 2,500 acres every 50 years. But when communities like Idyllwild form in forests, letting fires burn naturally isn't an option. The population there went up 10 percent between 2000 and 2010, and many of the homes there are built of wood. A serious challenge for firefighters and residents is the limited roads in and out of Idylwild and associated communities. Highway 243 runs from Banning off Interstate 10 through Idyllwild to Highway 74. The town is also accessible via Highway 74 between Hemet and Palm Desert. But due to the fire risk, Highway 74 is closed from the city of Hemet to Lake Hemet, and Highway 243 brom Banning to Highway 74 is also closed. Along with Idyllwild, the Riverside Sheriff's Department called for evacuations in Apple Canyon, Lake Hemet, Mountain Center, Hurkey Creek and the Camp Scherman Girl Scout camp, according to Cal Fire. Some hiking trails in the San Jacinto Mountain State Park are also closed due to the fire. In addition, Southern California Edison has reported some 4,000 of its customers and another 5,200 of the Anza Electric Cooperative, which is fed by SCE power lines, are out of service. Power in the Cranston Fire area was cut off at the request of fire officials to help keep firefighters safe, SCE said on its webpage. Some power lines in the Cranston Fire area have been damaged, however it's too early for the utility to say how extensive the damage has been. Idyllwild is a tightknit community. The local paper is the Idyllwild Town Crier, and the "mayor" is a dog named Max. One major question is the fate of the Idyllwild Arts Academy, a residential music school. The fire cancelled Wednesday night's chamber music concert at campus, said cellist David Speltz. "Last night was supposed to be our first concert, but that dissolved when we were evacuated," he said. He and his wife, a violinist, drove to Banning after noon Wednesday when officials called for residents to flee. He lives in Pasadena, but stays at a vacation home in Idyllwild during the summer to perform at the school's frequent concerts. The school attracts more than 300 students over a typical summer at the campus about a half-mile from the town center. Those students were evacuated to the Banning and Hemet areas, he said. "The school is a very big part of the town," Speltz said, with many of its faculty and performers also playing gigs in local restaurants and bars. Idyllwild Arts goes back to 1946 when founders Dr. Max and Beatrice Krone got a couple of USC professors and the then-conductor of the Los Angeles Philharmonic Orchestra to create a sanctuary for music and arts for people of all backgrounds, according to the academy's website. It opened in June, 1950. The academy sits on 205 acres of forest in the San Jacinto Mountains, about a half-mile outside of Idyllwild's tiny town center. The place started out as the Idyllwild School of Music and Arts, aka ISOMATA, and it was changed to Idyllwild Arts in 1995. It's been a year-round residential college preparatory high school for the arts since 1986, drawing some 300 students from some 25 countries. The summer workshops run from one to eight weeks, drawing nearly 2,000 kids and adults over the course of a summer. 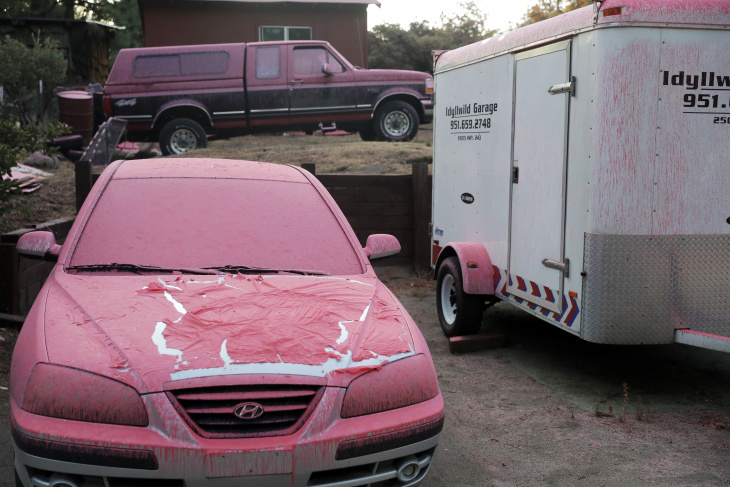 There is some hope for those in the path of the Cranston Fire is on the way. The heat wave ends after today, and the strong winds tend to die down at night, making it easier to fight than the fires stoked by the unrelenting Santa Ana winds in the fall. July 27, 7:40 a.m.: This story updated with a note about our coverage plans today and an a new total of evacuees who spent the night at Banning High. 9:37 p.m.: This article updated with the latest information about the fires size and evacuation zones. 5:14 p.m.: This story updated with new information about the size of the fire, power outages and the Idyllwild Arts Academy. This article originally published at 2:40 p.m. on Thursday. Caleigh Wells and Jacob Margolis contributed to this report.